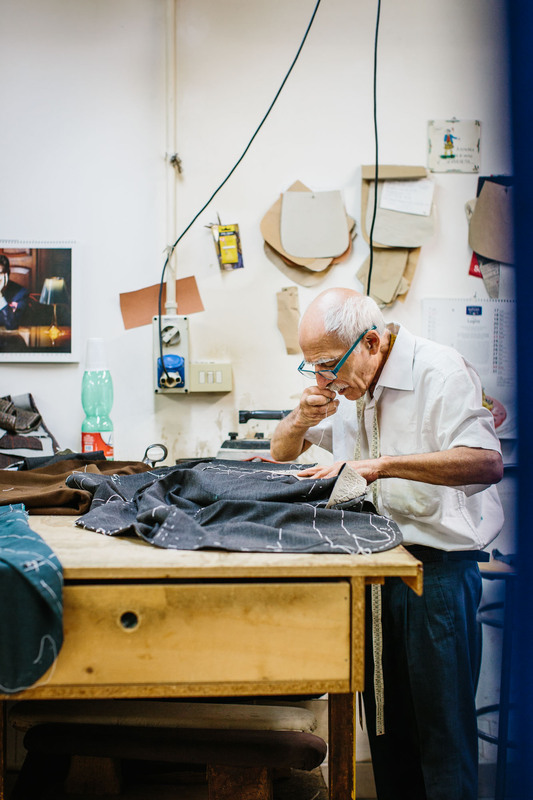 Renato Ciardi, who sadly passed away earlier this year, was truly one of the greats of Neapolitan tailoring. Succession planning is rarely one of a bespoke tailor’s strengths, but fortunately the Ciardi family began planning for this several years ago, and Enzo Ciardi (above, left) has been the head cutter for some time. 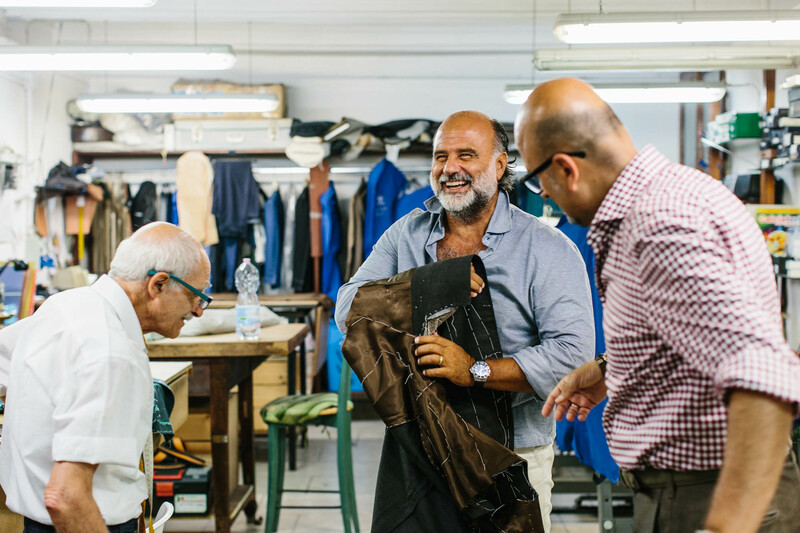 It was with some confidence, therefore, that I visited Enzo and his brother Roberto earlier this year, to commission a suit in a grey high-twist wool. 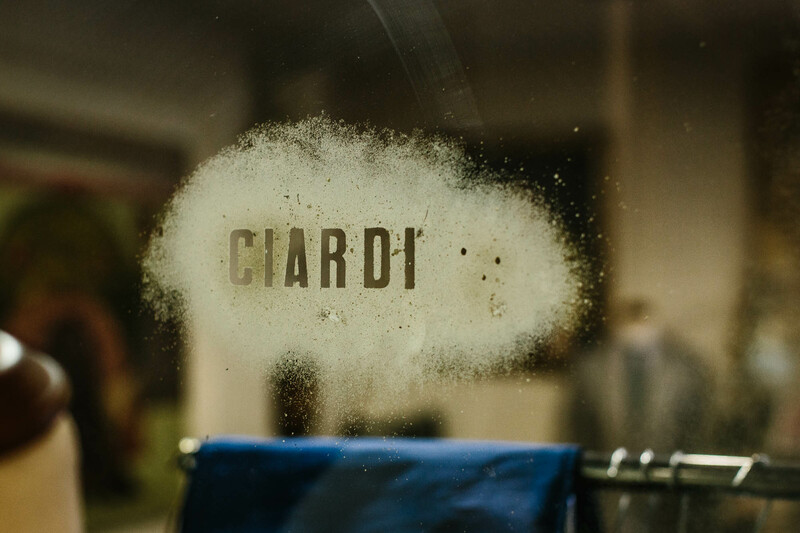 The Ciardi atelier is on the ground floor of a relatively new block on Via Giuseppe Fiorelli, in the middle of the historic centre of Naples. 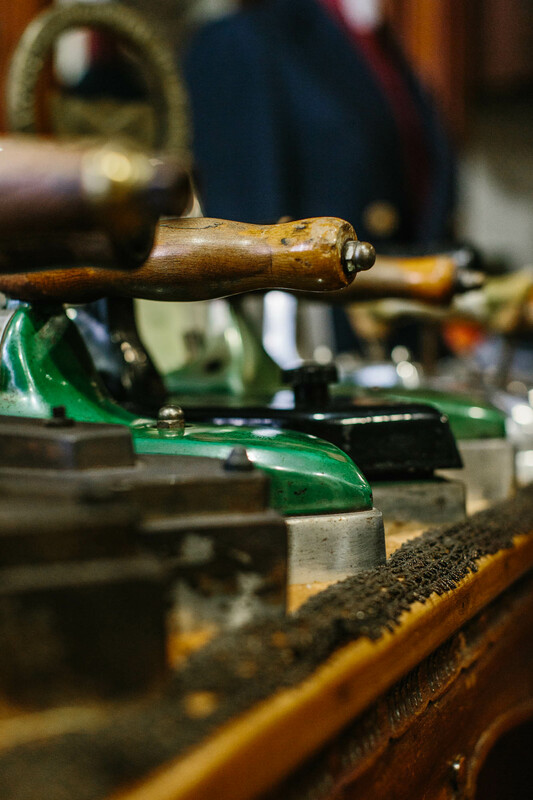 The atelier itself is deep with history, though, with Renato’s awards and photographs of the great man around the walls, and two rows of historic irons on facing tables. 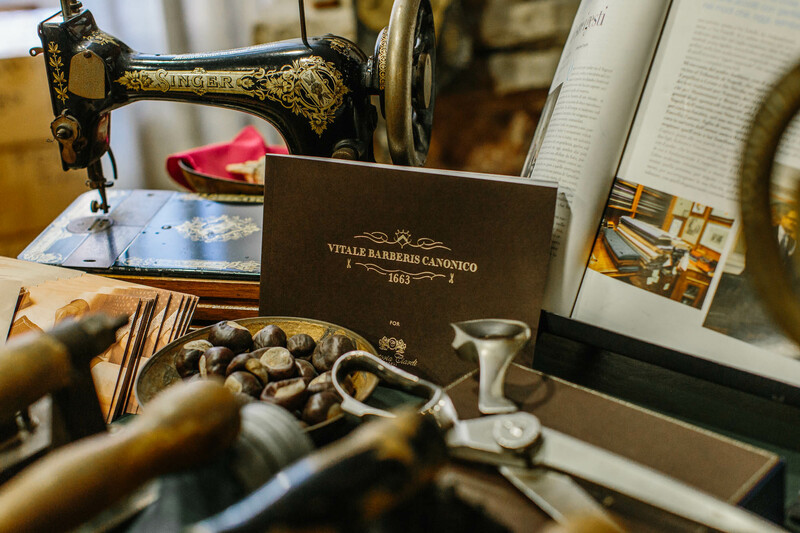 As a visitor to a famous tailoring house you secretly hope for these little things - souvenirs and ornaments that make its history manifestly real. It shouldn’t matter (it should be the product that matters), but it is a pleasurable part of the experience. Downstairs there is a small workshop (some is done off site) with space both for Enzo and Roberto (cutters) and five coatmakers. As this was summer a lot of linen and linen mixes were going through, including blues, creams and forest green. The detail of the green jacket below shows one decorative element that the Ciardis like - piping in complimentary colours on the inside of the jacket. 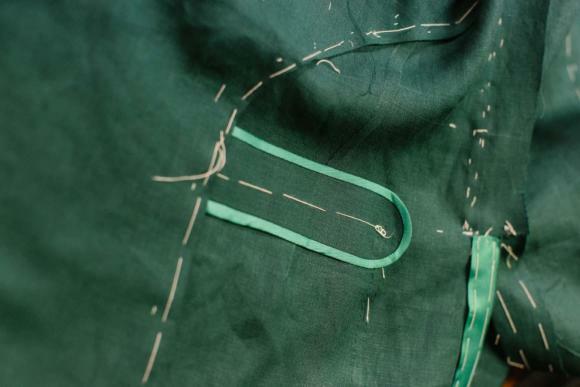 This jacket has been self-lined in the front (with the same material) but the pocket on the outside requires this supporting cloth on the inside, which is then finished with a brighter green. It’s a little strong a contrast for me, but I did very much like the brown lining that Enzo had in his grey jacket - shown below - and opted to have that in the jacket of my suit too. I generally just have matching linings in my tailoring, but some subtle lining colours can be particularly complimentary, or bring out a nice aspect of the cloth. The Ciardi style is pretty typical Neapolitan: very soft canvas and shoulder pad, broad lapel, curved and open quarters. 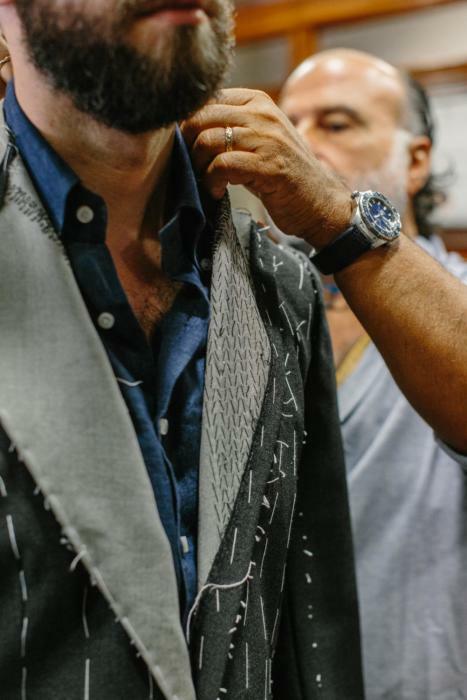 The shoulder is not extended, tends to have a ‘shirt shoulder’ construction, and is finished with a subtle roping or ripples where the cloth is gathered at the top of the sleeve (shown on Roberto, below). 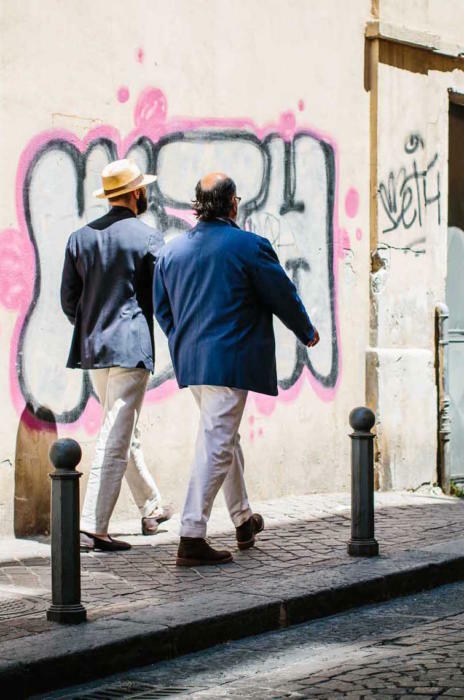 Both, again as with most Neapolitans, are quite subtle but do serve to give an impression of width to the shoulder without the need for padding. One thing the Ciardis always do is cut the canvas of their chest on the bias, which gives it greater stretch and therefore comfort. 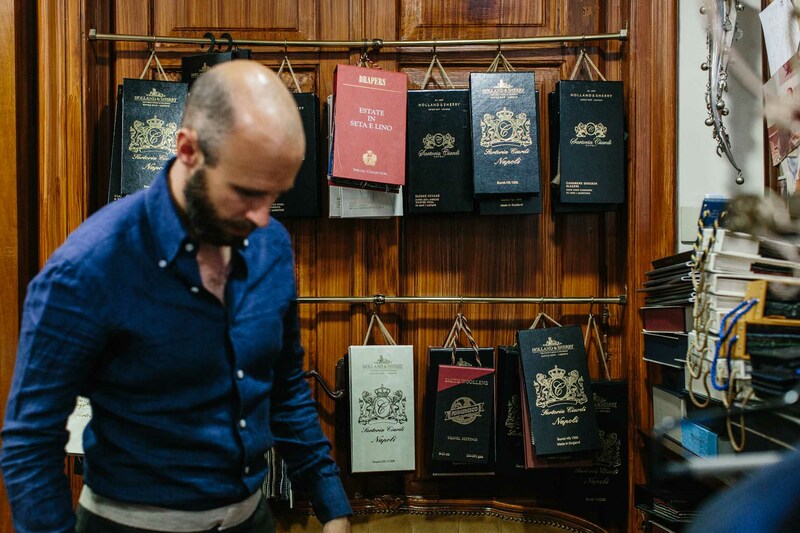 This is something not all Neapolitans do, and only Anderson & Sheppard and related tailors do in the UK. The make and finishing at Ciardi is pleasingly neat - something that has a tendency to be better at the larger bespoke houses in Naples. 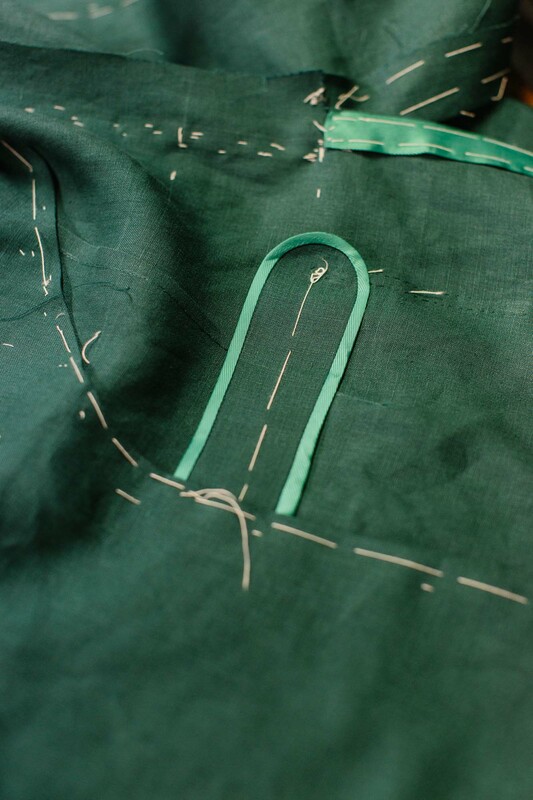 And the brothers occasionally like pick stitching on the jacket’s lapels and elsewhere in contrasting colours. Again, not for me, but there is a fondness for brightness there, particularly in the summer. One thing that tickled me about the fitting was that Enzo held the ends of the trouser legs for me as I put them on. This is slightly awkward, as they have to be lowered gradually as your foot goes down the leg, but it is a nice traditional touch that I have only experienced elsewhere at Edward Sexton and Chittleborough & Morgan. It is supposed to stop the trouser trailing on the ground as you put it on, and therefore prevent it getting dirty. The basted fitting, shown here, was very strong. 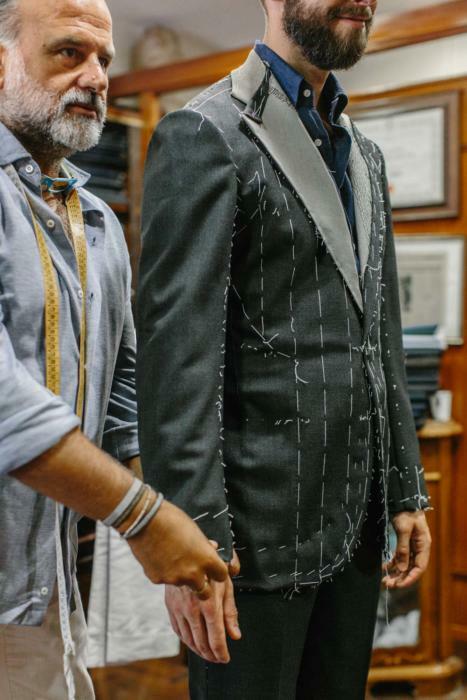 This first fitting is for the tailor, of course, to get the balance right and sort out the fundamental structure of the suit. There are few design questions and it is not for the customer to begin judging the overall look. But it is always nice to see the cloth already running cleanly up the back and hugging the neck. And to hear that the cutter is considering all the body points you know from experience will be an issue, such as my hollow lower back. 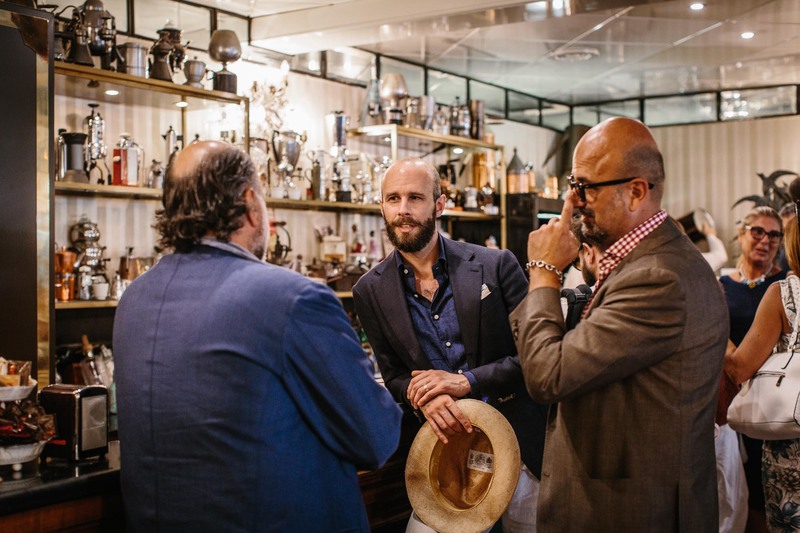 I hope to have the suit fitted again during Pitti in January, and finished soon after. It will be great to be able to report that the house of Ciardi is in great hands, and with the new generation still deserves to be considered one of the best in Naples. Travel: Currently the Ciardi brothers travel only within Italy, to Japan and Korea. But they are planning London (Enzo’s English is coming along impressively). Cloth: A high-twist charcoal wool from Vitale Barberis Canonico: Spring Four Ply (853.601/56, 390g). You can follow the discussion on Sartoria Ciardi – The next generation by entering your email address in the box below. You will then receive an email every time a new comment is added. These will also contain a link to a page where you can stop the alerts, and remove all of your related data from the site. The clean trouser front and smooth segue into the lower back are pleasures to behold, indeed. The top photo looks promising, as well. Best wishes on your latest commission! What was the raison d’etre for comissioning this suit out of interest? I had seen the Ciardi style and liked it, and it’s one of the few famous houses I haven’t tried. As to the suit itself, I realised recently I don’t have many business suits from top-end makers, hence this grey worsted and the grey flannel from Panico. Also don’t have many suits from Neapolitans, as mentioned on that Panico post. I still think that you might want to consider holding your hat, ‘crown out’. I would love to commission a Neopolitan sports jacket but really do not like short jackets. Are there any with a longer house style. It looks like the gentleman in the white shirt contributes a lot of experience to team. So the transition to the next generation is very smooth! I like your choice of style. Is this a peak lapel? I cannot tell exactly from the picture. Caliendo did the same with my trousers fitting. 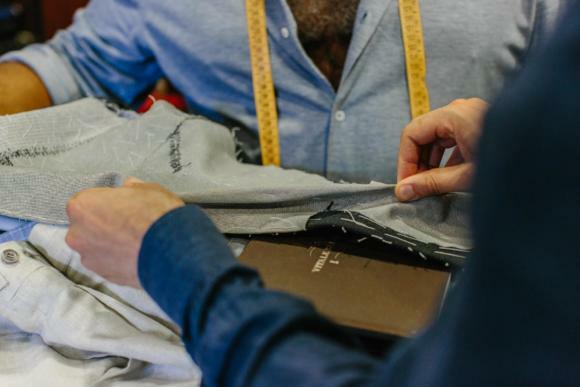 In a nutshell, what is the strength of Neapolitan tailoring? I understand it works in a mediterranean climate and the price point may be an issue too. However, the jackets are rather short, the trousers often both tight and short. Shirt sleeves and high gorges often make one’s eyes wander to the wearer’s chest rather than head. All these features often “shrink” a person’s silhouette in my eyes. I can see it works in the right climate and on rather short people, but have never understood its general popularity amongst i-gents. It’s not flattering on everyone, is it? Just a general question. The strength is the soft construction and casual, rounded style. 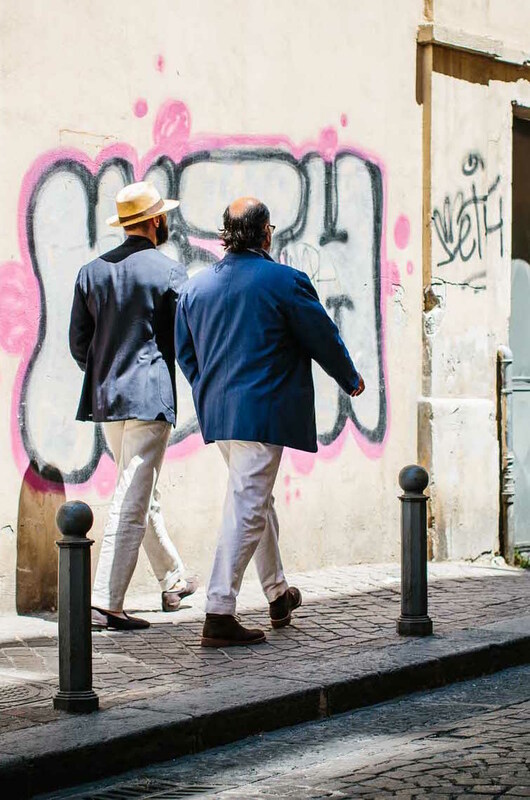 It’s what separates all Neapolitans from everyone else, it’s what makes them more casual and easier to wear with jeans, for example, than any other style, and all the style points you mention can be changed. What cannot be copied easily, though, is that casual style in shoulder, forepart, pocket and so on. So keywords are non-corporate, non-formal & leisure? Jackets almost blousons for “in between” occasions? Even so, with a long neck and sloping shoulders, I’m biased toward British style. E.g. the pic of Michael Browne in his cobalt blue jacket by C&M on your blog when you presented the Friday polo shirt the first time, strong&masculine lines but still relaxed and dressed down. I think you are biased regarding this point. If you go on C&M’s web site, they have a great shot of their model wearing a beautiful check jacket, velvet trousers and polo neck sweater that illustrates how achingly cool a louche translation of their house style can be. You are our style guru and are supposed to experiment on our behalf. Could you commission a ‘knock about suit’ from C&M to settle this issue once and for all ? You should consider it your duty. Thanks David, but I’m afraid that’s not going to work for me. What is the price for a 2-piece suit (including VAT)? Simon, apart from flannel or tweed, what other fabric would be nice fabric for a more relaxed but still business grey Neapolitan suit ? Many thanks for this post – and indeed the entire blog. It has been a fascinating read over the last months. May I ask two questions? 1) Net, net – which Neapolitan house would you recommend for a first commission? I am looking for a “value” offer – was considering Caliendo, Ciardi or de Cesare, based on your posts. If I understand correctly, starting price at these three range from 2300 to 2800 Euros incl. VAT. Any thoughts? Apart from stylistic differences, is there anything that sets them apart in quality (make, finishing etc.)? 2) My idea was to commission a navy suit in a casual, structured material (e.g., hopsack) where the jacket could be (and mostly would be) worn on its own on informal occasions (e.g., with chinos) – but also as a suit with a more formal shirt and shoes. Would 3 patch pockets work in this case – or would you only use those on a sports jacket? Again, many thanks for everything – it has been a joy to follow your blog. As above, largely because they are one of the last big names I haven’t tried. I have all my suits made with 2 patch pockets. (Exept one for formal occasions) Most of the time I don’t wear a suit/tie combination and wear the jackets as seperates. But even as a suit it works great in my opinion. Maybe not if you’re trying to achive a very formal look with a silk tie but with a cashmere tie for example. It works well with a turtleneck or a friday-polo too. Hi Johnny, many thanks! What’s the reason to have 2 patch pockets only (i.e. not for the breast pocket)? I just dislike it from a personal point of view. I would not want to have that on a sportcoat neither. Plus I find with a pocketsquare it could seam to flashy. Maybe as another info: I think it’s odd to have patchpockets on formal suits, like pinstripes, grey worsted and so on. What are your thoughts on getting a Neapolitan to do your black tie? DB with a shawl collar would not work at all. The shawl goes with a single button. Precisely why it is not a good idea!! Simon are you having an off day? RL is a lifestyle designer who at very best makes MTM at daft high prices. Why would you recommend that to anybody? A double breast shawl collar would be very unbalanced. But as a DB the shawl ends up too low and sits there against nothing, unlike a classic Db where the crossover slips down to nothing. Which is why your rarely if ever going to see a DB shawl, unless you buy your clothes at RL. Your man RL is advertising a very nice DB shawl collar made from corduroy. With no horizontal roll. And a buttonhole. I think it looks superb! Do you know anything about the 2 tailors on Condit street, Connock & Lockie or Sims & McDonald? Only from mentions from others – no personal experience I’m afraid. Are you loath to pass on what others have said, obviously clarifying that you have no experience? Yes, I would rather not do so, partly because it’s someone else’s experience not mine, so without all the context and first-hand information. It’s also only partial and passing. If I had similar information from a dozen or so people that would be different. Great post Simon, I enjoy learning about the range of Neapolitan tailors operating today, and the differences between them. 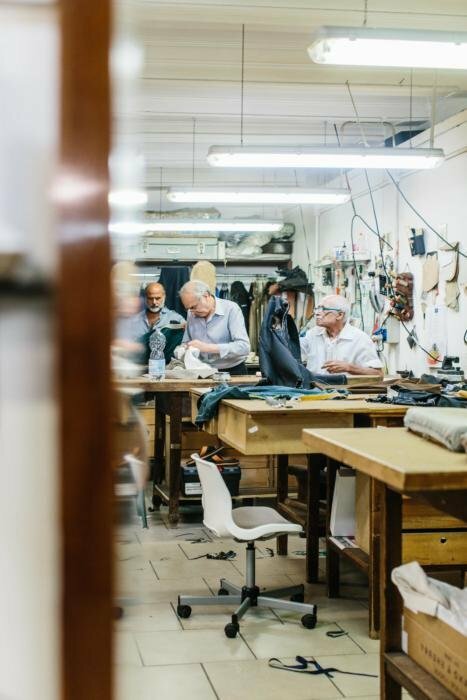 On a related note, how would you recommend arranging visits and browsing between tailors, if one was in the fortunate position of visiting Naples? Are appointments required to visit ateliers, should one bring an Italian speaker to translate & is there a best time of year to visit, e.g. when tailors are not travelling to trunkshows, etc? 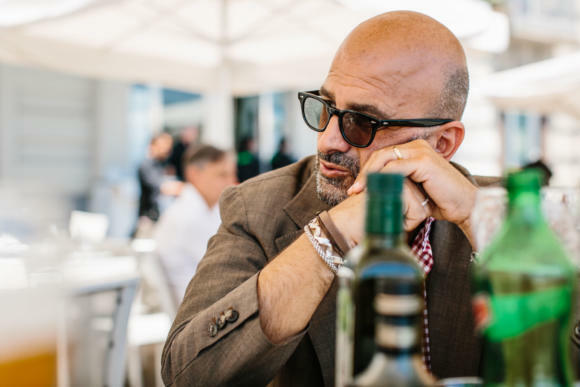 I am sure I am not alone in considering combining an Italian holiday, with commissioning some fine tailoring, particularly if one doesn’t live in a tier-1 city like London. Don’t worry too much about the time of year – just don’t go in August. Do phone ahead and make appointments though. Good to ensure everything is there for you if you’re coming a long way. Translation is tricky. Some speak good English (Caliendo), some middling (Dalcuore, Ciardi) some none at all really (Panico). A translator would make everything possible, but I try to mention where people don’t speak enough English to effectively make a commission without getting into a big discussion with them about styles etc. I have a picture of a jacket and I would like to ask you a question about it’s shoulder construction. Where could I send you the picture? Also, a long time ago you mentioned you had started another Liverano commission, any news about that? I’ve been looking forward to it! You can post a link in a comment, or email me – details in the contact section. I’d warn in advance though that it’s hard to tell that much about construction from just imagery. Nice read, and curious to see the final product. Not good unfortunately. I need to take some photos at some point – hard to get around to doing it when the result wasn’t great! You have touched upon this briefly in the article but how is their level of finishing compared to other tailors (Neapolitans and others)? I am curious about the work on the buttonholes in particular (Milanese on the lapel buttonhole? ), which is not always the neatest with Neapolitan tailors. Do you know or could check whether Gieves and Hawkes made Prince Harry’s «engagement suit»? I’m guessing it would be RTW in case, but would be interesting to know. I am intrigued by the waist band shown in the basted fit pics. It looks to be narrower in the front, gaining width in the back. That intrigues me in terms of offering an improved fit for those of us with a hollow lower back and a decent rear end. Anything you can add? Great content and photos, as always. 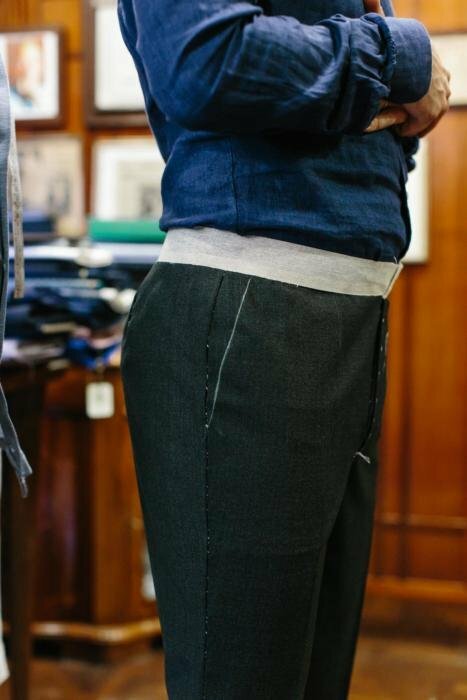 telling from your experience with Neapolitan tailors, is there something like a minimum rear collar height for a shirt to be worn under their jackets, given the rather high jacket collar? Would e.g. Drake’s oxford button down shirts (rear collar height 4,3cm for collar size 38cm/15in) work under a Neapolitan sports jacket? I wouldn’t say that the Neapolitan tailors use a particularly high jacket collar. In fact I’d say the English tend to be higher on average. But in any case it will depend a lot on the height of your particular neck – which the tailor will try to make the collar proportionate to. I have long experience with neapolitan tailors. Pay attention during the essays. Most of them tend to make not only low collars, I mean thinner tha average, but also wide, loose on the back, Some of them says it’s peculiar neapolitan (the collar that “scolla”) but is horrible. So, insist to make it high and tight. Simon, you mentioned on this post that finding a grey fabric for a relaxed business suit after flannels is not easy. How do you find the sisal panama from Lock? Can I assume you chose that over the classic panama as it gives protection from the sun but carries less cultural baggage, and so makes it easier to carry off? I chose the San Remo in brown for that reason and it is foldable, but the linen construction does not allow for much air to waft through. Indeed, I like the darker colour for that reason. It’s worked very well. I’m looking to get myself something special. I’m currently hesitating between a Liverano 3 pièces, and a double breasted Anderson and Sheppard. Knowing that you have commissioned bespoke pièces from them in the past, i would like to get your thoughts on what would constitute a more special piece? It will be my first order for either tailor. I love both, and they would both be rather special. I would say pick on style, rather than make or fit, as they are around the same level (though A&S a bit cheaper). Have a look at both styles and see which speaks to you the most. I have to say though, that the A&S DB style is my personal favourite out of pretty much everything I’ve ever had made. Could you share Enzo’s email with me please? Also, I was wondering if you’ve heard or experienced Sartoria Tofani. Would love to hear your thoughts on them. Thanks. We communicate by phone mostly, and that’s a bit more personal. Can I suggest you use the contact form on the site instead? Thanks, Simon. I’ll try that. Also, I’m guessing – not much on Tofani? Hi simon, i am an avid reader of your blog . I’m seeking advice about how to start a career in the sartorial world. I live in Arizona in the United States, and there aren’t many tailors around and certainly no bespoke tailors within 1000 miles. I have been passionate about suits and menswear my whole life and now that I’m trying to start a lifelong career, I hope to find one doing something I love which is tailoring. I had an interview for an apprenticeship with a Savile Row tailor that has an office in New York, however they decided against taking me on due to lack of experience. However I have no idea how to get any sort of experience in this field other than working at retail stores or alterations tailors. My question for you, Simon, is what is the best way for a young man to launch a career in the tailoring community? Is an apprenticeship the only/ best option? Are there schools that teach the art of bespoke tailoring that many tailors would recognize as credible? I’m planning to move to New York to look for work there but I’m nervous and would like any advice you can give me. Shame that Ciardi does travel to the US. Which of the Neapolitan houses do travel to the States?